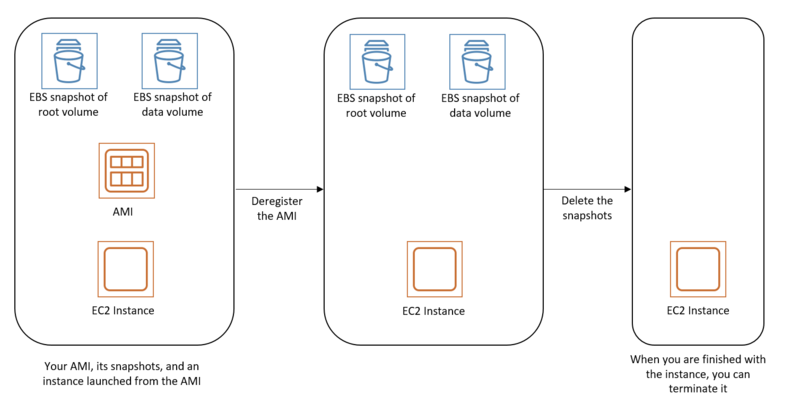 The procedure that you'll use to clean up your AMI depends on whether it is backed by Amazon EBS or instance store. For more information, see Determining the Root Device Type of Your AMI. The following diagram illustrates the process for cleaning up your Amazon EBS-backed AMI. In the navigation pane, choose AMIs. Select the AMI, and take note of its ID — this can help you find the correct snapshot in the next step. Choose Actions, and then Deregister. When prompted for confirmation, choose Continue. It may take a few minutes before the console removes the AMI from the list. Choose Refresh to refresh the status. In the navigation pane, choose Snapshots, and select the snapshot (look for the AMI ID in the Description column). Choose Actions, and then choose Delete Snapshot. When prompted for confirmation, choose Yes, Delete. (Optional) If you are finished with an instance that you launched from the AMI, terminate it. In the navigation pane, choose Instances. Select the instance, choose Actions, then Instance State, and then Terminate. When prompted for confirmation, choose Yes, Terminate. When you deregister an instance store-backed AMI, it doesn't affect the files that you uploaded to Amazon S3 when you created the AMI. You'll continue to incur usage costs for these files in Amazon S3. Therefore, if you are finished with these files, you should delete them. The following diagram illustrates the process for cleaning up your instance store-backed AMI. Deregister the AMI using the deregister-image command as follows. 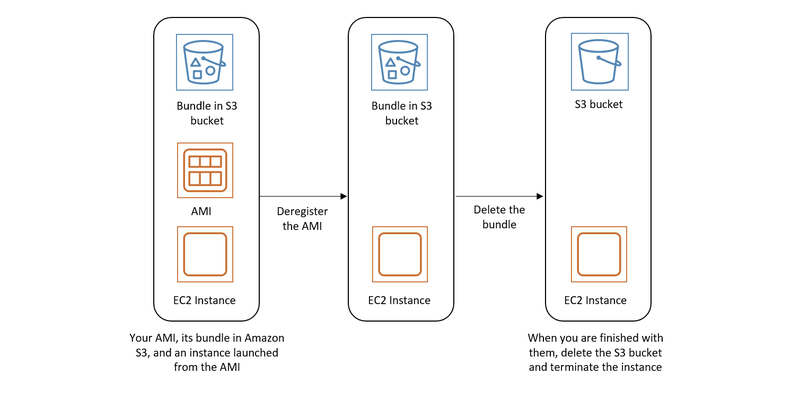 Delete the bundle in Amazon S3 using the ec2-delete-bundle (AMI tools) command as follows. (Optional) If you are finished with an instance that you launched from the AMI, you can terminate it using the terminate-instances command as follows. (Optional) If you are finished with the Amazon S3 bucket that you uploaded the bundle to, you can delete the bucket. To delete an Amazon S3 bucket, open the Amazon S3 console, select the bucket, choose Actions, and then choose Delete.